It’s truly appalling to see how viciously and unsympathetically some of the people on this show behave. It was no surprise that Dollar Bill was the one to lead the entire company in a celebratory cheer when Craig Heidecker’s shuttle exploded, with only Taylor and Mafee bothering to process the fact they were getting rich because a man died. Wendy took his death particularly hard, and it was interesting to see Chuck step in to comfort her since he understood the nature of their relationship and why he meant so much to her. 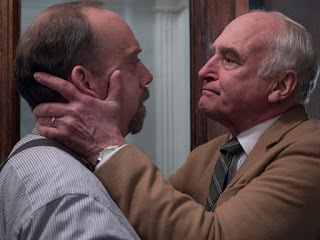 Chuck really knew how to manipulate another dynamic, stepping in as the surprise guest to present his father with an award from Yale before which he padded his introduction with references to loyalty. The gambit worked, and Chuck got a strangely intimate and extended kiss on the lips from his father in addition to Ira going away as a threat. As Oliver gets angrier and angrier with Bryan for pushing, Chuck’s onetime loyal devotee is being successfully targeted by Axe’s henchmen, who aren’t too busy doing shadowy work for him to help Wags’ eternal resting place, a fittingly odd sudden obsession. As usual, Axe managed to manipulate everyone around him on his foundation board into enthusiastically endorsing his top choice, pitched by Oscar Langstraat, played by Mike Birbiglia from “Orange is the New Black.” For someone who’s trying not to trade, Axe is being awfully unsubtle about directly working with so many people he really shouldn’t be engaging in trading conversations.